I'm not sure what my favourite Tim Cook quote from last night's AllThingsD interview is. "That's a great question. I'm not going to answer it"? "You're right. I'm not going to tell you?" "Who had the next question?" If anybody believed they'd be able to trick Apple's CEO into revealing anything he didn't want to, they were sorely disappointed. What's striking about the interview, I think, is that you really get a sense of the man: not just the core of steel that's taken him to the top of the world's most interesting company, but also the easy charm that makes him so famously likeable. It may well be an act, but if it is it's a really good one. Tim Cook didn't just charm his interviewers and bat away their questions, though. He spoke about some of the big issues affecting Apple, and about his own place in the organisation. The whole thing felt like a man stepping out from underneath the shadow of Steve Jobs. In among the assertions of Apple's general awesomeness, there was some real substance to the interview. Cook wants to do "more semiconductor things in the US" as well as more assembly work, although he believes that the infrastructure simply isn't there for the latter. He wants Apple to be much more open — apart from about its future products — and to embarrass other tech firms into behaving better industrially and environmentally. Cook also described Apple's attitude to various product categories. He admitted to "intense interest" in the TV market provided Apple can control the core technology, argued that tablets and PCs are and should remain as separate product categories, dismissed tablet/laptop hybrids and emphasised again and again that Apple's aim is to make the best products, not to build to a particular price point or match competitors' specs. 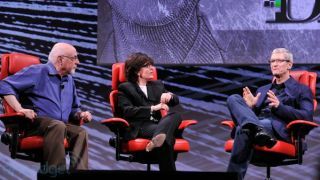 He strongly suggested that Ping, Apple's social network for music, is likely to be boiled down for glue, and he implied that Facebook integration is coming to iOS. I think the atmosphere was different this year: Jobs' interviews were more tense, more adversarial — adversarial in a good-humoured way, but adversarial nevertheless. Cook's interview was a more cerebral affair, I think, and while Cook's a less magnetic speaker than Jobs I think he's just as convincing. I think that when Tim Cook says receiving mail from Apple customers is a "privilege" he means it, and when he says about preserving Jobs' legacy that while he likes museums he doesn't want to live in one he means that too. Most of all, when he says that "the juices are flowing. We have some incredible things coming out" or talks about how we'll be "excited" and "really happy" about what Siri will do in the coming months, I'm not detecting a reality distortion feed. Roll on WWDC.